One of the world's most successful and useful light turbine helicopters, the Hughes/McDonnell Douglas/MD Helicopters 500 series began life in response to a US Army requirement for a light observation helicopter. Hughes won the US Army observation helicopter contest against competition from Bell and Hiller with its Allison 250 powered YOH-6A Cayuse, which first flew in February 1963. By then Hughes was already working on a civil variant, to be marketed as the Hughes 500. 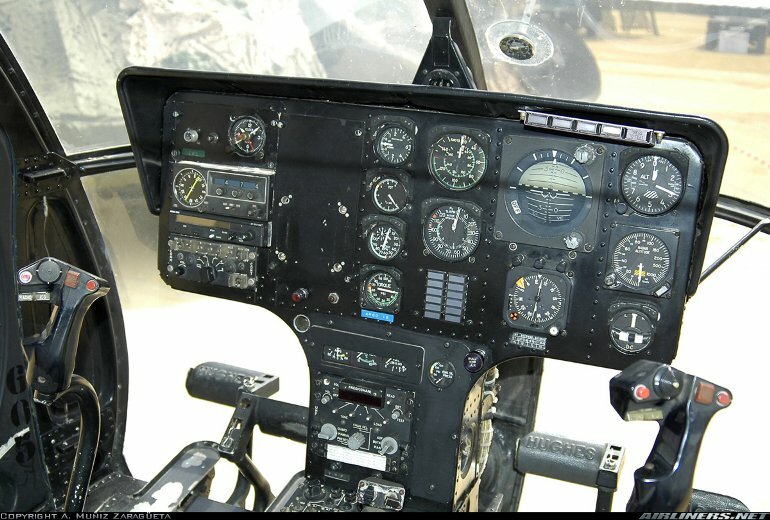 However, the engineering and certification designation for all military and civil variants of this helicopter type is Hughes Model 369. It was offered in basic five and seven seat configurations, and a 500U utility version. The 500 and 500U were powered by an Allison 250-C18A engine. In 1970 the 500C followed with a more powerful 250-C20 turboshaft. From 1976 deliveries were of the 500D, an improved version with again a more powerful engine, the 250-C20B, a T-tail, and new five blade main and optional four blade tail rotors. The 500D was followed by the 500E from 1982 with recontoured nose and various interior improvements including greater head and leg room. The 530F (first delivery January 1984) is a more powerful version optimised for hot and high work. McDonnell Douglas acquired Hughes Helicopters in January 1984, and in August 1985 the Hughes name disappeared. From then on the 500E and 530F were built as the MD-500E and MD-530F Lifter. After the 1997 merger with Boeing, the line was up for sale. Bell's plans to acquire the Boeing civil helicopter lines were thwarted by the US Federal Trade Commission (FTC) in 1998. Then in January 1999 Boeing announced the sale of the light helicopter lines to MD Helicopters, a newly formed division of Netherlands based RDM Holdings. The sale was finalised in february 1999. In April 2000 MD Helicopters contracted Kaman to build the fuselages for the single engine MDs. Military variants are marketed under the MD-500 Defender name. License production was undertaken in Argentina by RACA, in Italy by BredaNardi (later merged with Agusta), in Japan by Kawasaki, and in South Korea by Korean Air. 500C - One 207kW (278shp) Allison 250-C20 turboshaft driving a four blade main rotor and two blade tail rotor. MD-530F - One 280kW (375shp) max cont rated Rolls-Royce 250-C30 driving a five blade main rotor and two or optionally four blade tail rotor. 500C - Max cruising speed 232km/h (125kt), long range cruising speed 217km/h (117kt). Initial rate of climb 1700ft/min. Hovering ceiling in ground effect 13,000ft. Range 605km (325nm). MD-530F - Max cruising speed 249km/h (135kt), economical cruising speed 228km/h (123kt). Initial rate of climb 2070ft/min. Service ceiling 18,700ft. Range with standard fuel and no reserves 429km (232nm). 500C - Empty 493kg (1088lb), max takeoff 1157kg (2550lb). MD-530F - Empty 722kg (1591lb), max takeoff 1406kg (3100lb), max overload takeoff 1610kg (3550lb), max takeoff with sling load 1700kg (3750lb). 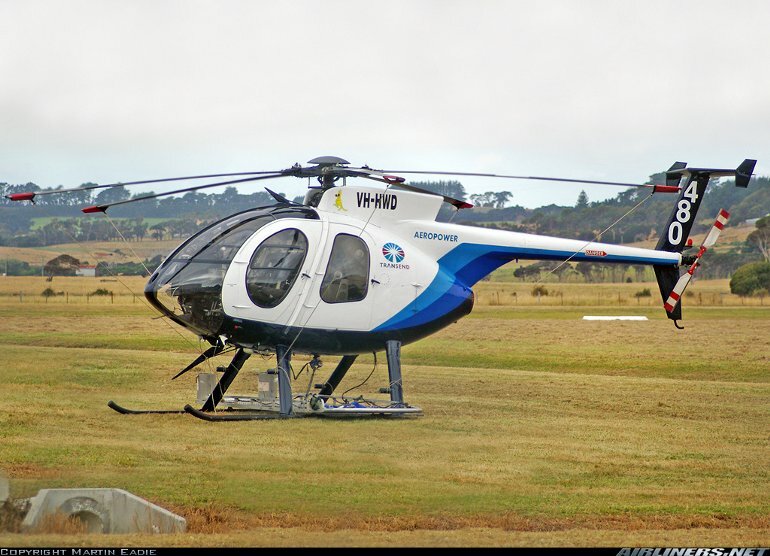 500C - Main rotor diameter 8.03m (26ft 4in), fuselage length 7.01m (23ft 0in), height 2.48m (8ft 2in). MD-530F - Main rotor diameter 8.33m (27ft 4in), length overall rotors turning 9.94m (32ft 7in), fuselage length 7.49m (24ft 7in), height to top of rotor head with standard skids 2.67m (8ft 9in). Main rotor disc area 54.6m2 (587.5sq ft). Typical seating for five, two in front bucket seats including pilot, and three on rear bench seat. Alternatively can accommodate two stretchers and medical attendant, plus pilot. 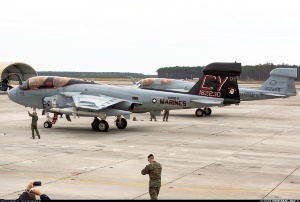 Approximately 4700 Hughes 500s and MD-500s have been built, including large numbers for military customers.